Palestine Real Estate & Palestine TX Homes For Sale | BuyPalestine.com Real Estate is Local, Your Agent Should Be Too! Agents do a lot more than just open doors and the agent you choose matters. You need a local agent who is very familiar with your search area—because your agent’s area expertise can make or break your deal! YOU NEED A LOCAL EXPERT- While most real estate agents cover a fairly big geographical area, the state of Texas is just too big to know everything about every market. As you can imagine, the local markets in Amarillo, Palestine, Dallas and Houston are not the same. I can’t tell you the first thing about the real estate market in Austin or Houston and I wouldn’t even try—because my expertise area is in East Texas. Is their dirt even red? Is there even dirt or is it all rocks and sand? See my point? It might as well be another country as far as the differing markets go. “I’VE GOT A GUY FOR THAT!” – Sometimes there is a snafu during the transaction. In a perfect world, it’s a seamless deal; but if you have a problem, you need an agent with connections. A good agent with local contacts can get it done. In a smaller area like ours, everyone knows each other and it is much faster to “make it happen” when your agent is entrenched in the market on a daily basis. It’s all about who you know and a local agent knows exactly who to call to get things done. WHEN IN ROME…OR PALESTINE…OR ATHENS– Local real estate customs and trends can vary even just a few towns over, so it is important that your agent is familiar with the area and how the locals do business. So many facets of a transaction vary depending on location. For instance, in the metro areas, appraisals may have an extremely fast turnaround or survey costs may be much cheaper. Why? Because they have more appraisers and they have smaller lots, on average. Local agents know the typical turnaround on things like inspections, appraisals, surveys, title work, utility connections and more. How much is typical for earnest money deposits and option fees? Local agents know the ins and outs of the local real estate industry and can provide you with insight that will save you money and make for as smooth of a transaction as possible. Any real estate agent licensed in Texas can sell property anywhere in Texas, but that certainly doesnt mean they should. Each market area is highly localized and an out of area agent may not have access to the local MLS. Will an out of town agent be able to estimate the days to sell based on inventory levels or advise you on a reasonable offer price? Will they know that the property has been on the market since 1975 because it is overpriced and there was previously a violent event on the property and everyone in town is creeped out by it? Can they suggest the best vendors or even access the local lockboxes? Can they give you directions without GPS? Can they show the property this afternoon? You see where I’m going with this. I could go on and on. Real estate is and always will be a hyper localized industry. Agents do unlock doors, but the market knowledge inside an agent’s head is what truly serves the client. After all, to get a truly good deal, you need to know the dirt. 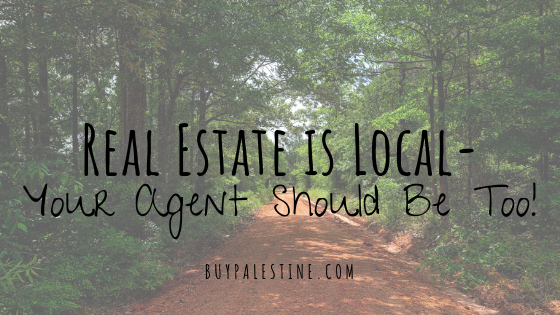 Lisa Priest knows the local dirt and is a Broker/REALTOR® with Picket Fence Realty, Inc. You can reach her via phone or text at 903-948-3343 or read more at BuyPalestine.com.